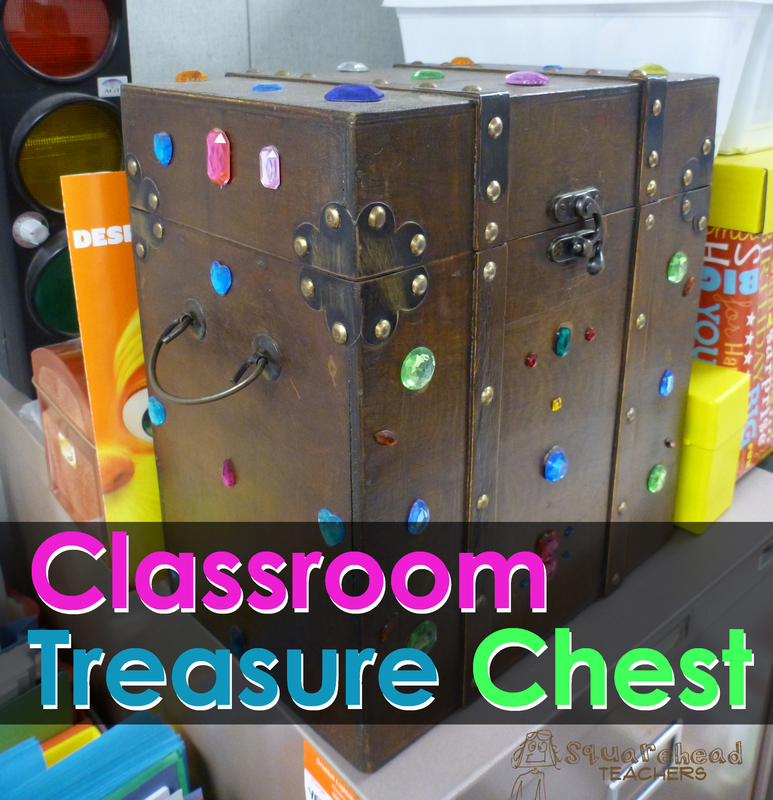 This is one of the coolest classroom treasure chests I’ve ever seen! The teacher found this old chest at Michael’s, and then glued plastic gems on it to add to the “treasure” effect. You don’t need a cool box for your treasure chest. I used a woven basket with a lid. Other teachers just use a cute gift bag or a decorated plastic box. The point is to find something that will motivate your students, and be manageable for you. MUST-READ TIP: My first year, I put all the prizes in the box at the beginning of the year. This was a big NO-NO. After a few months, all the good stuff was picked out and the kids weren’t very motivated by the basket. So I had to constantly worry about what new stuff to add and what to do with the stuff that wasn’t ever getting picked. So, don’t put all your prizes in at once. Instead, split your stuff into 4 groups (or some other number) so you can add new stuff every quarter. junk from catalogues like Oriental Trading Company, etc. This entry was posted in Management, Student Behavior and tagged Children, classroom management, Education, Elementary School, Kids, Management, Teacher Resources, Teachers, Teaching, treasure by Squarehead Teachers. Bookmark the permalink.